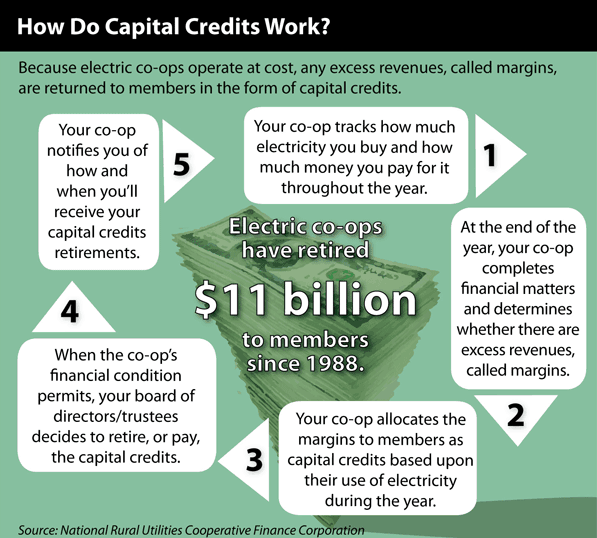 Capital Credits — York Electric Cooperative, Inc.
Capital Credits are a benefit of membership in a member-owned utility. Each year York Electric uses the revenues that exceed operating costs as equity. These funds and borrowed capital allow York Electric to serve a growing number of members while implementing the latest technology to provide the best possible service. As a not-for-profit utility, York Electric later returns these revenues to the members who originally paid them in their electric bills. Each year, our members receive Capital Credit checks. Members receive Capital Credit checks in the mail unless the amount due to them is less than $15. If the member’s refund is less than $15, the amount will be distributed and printed on their utility billing statement as a line item credit. The amount of Capital Credits returned is determined by total revenues received over expenses for the cooperative and your total energy billings for the year. They are paid periodically with board approval after review of York Electric Cooperative’s financial status. If you move, please be sure to leave your forwarding address with us so we may send your Capital Credit check to you. Normally, you do not have to report your Capital Credit payment on your income tax return. However, if you have any questions concerning tax liability, please consult your tax preparer. For more information concerning Capital Credits, call our Member Services Department at 803-684-4248. As members of YEC, do we build equity in the co-op, and if we leave the area do we get a payout? Capital Credits are a benefit of membership in a member-owned utility. Each year, YEC uses the revenues that exceed operating costs as equity. These funds and borrowed capital allow YEC to serve a growing number of members while implementing the latest technology to provide the best possible service. As a not-for-profit utility, YEC later returns these revenues to the members who originally paid them in his/her electric bills. Each year, our members receive Capital Credit checks. Members will receive Capital Credit checks in the mail unless the amount due to them is less than $15. If the member’s refund is less than $15, the amount will be distributed and printed on their utility billing statement as a line item credit. The amount of Capital Credits returned is determined by total revenues received over expenses for the cooperative and your total energy billings for the year. They are paid periodically with board approval after review of YEC’s financial status. If you leave YEC’s service area, your Capital Credits remain in your name and member number until they are retired. Therefore, you need to make sure YEC has your current mailing address. York Electric is a cooperative. A cooperative is owned by its members and does not technically earn profits. Instead, any revenues over the cost of doing business are considered “margins”. These margins represent an interest free loan of operating capital by the membership of the cooperative. This capital allows York Electric to finance operations and, to a certain extent, construction. The utility then returns this capital to the members in later years. How often will I receive an allocation notice? You should receive an allocation notice each year after a financial audit of York Electric has been completed. During the month of May, members receive Capital Credit checks in the mail unless the amount due to them is less than $15. If the member’s refund is less than $15, the amount will be distributed and printed on their utility billing statement as a line item credit. What do I have to do to start accumulating Capital Credits? Capital Credits are calculated by York Electric for every member who purchased electricity during a year in which the utility earned margins. No special action is required to start a Capital Credit account. Your membership with York Electric activates your Capital Credit account. How are Capital Credits calculated? The amount of Capital Credits you earn in a given year is based upon the amount of electricity purchased. Each member receives a credit based on a percentage for each dollar of electricity purchased. Will I receive a Capital Credits check every year? Not necessarily. The board of trustees must authorize a refund before you receive a check. When considering a refund, the board analyzes the financial status of the cooperative and will not authorize a refund if it is not in the best interest of the membership. Can I use the Capital Credits I have allocated to pay my electric bill? No. Allocated Capital Credits may not be used to pay current bills. While your electric bill is due monthly, you will not be entitled to your Capital Credits until the board of trustees authorizes a refund. This will take place over many years, since York Electric needs the funds to grow. What happens to the Capital Credits of members who die? The representative of the estate can have the balance of Capital Credits transferred into the heir’s name and the balance will be paid out as the board of trustees approves refunds. What happens to my Capital Credits when I leave York Electric’s service area? Your Capital Credits remain in your name and member number until they are retired. You just need to ensure that York Electric has your current mailing address.